PRODUCT: 50 AMP 125/250 VAC MALE TWIST TYPE LOCKING POWER PLUG (CS6365 TYPE). PRICE/EACH. 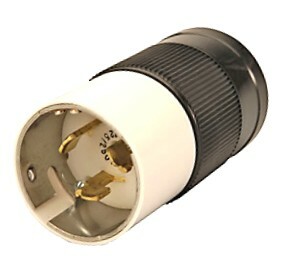 California standard Type 6365 twist type locking male plug, 50 amp, 3 pole, 4 conductor. MATES TO CS6364 or CS6369. UL Listed. Twist type locking design with heavy duty housing resistant to many chemicals and drop abuse. Cord clamp with #10 solid brass terminal clamps and screws for superior wire holding and excellent conductivity. Color may vary from that shown. Generally these are made by Marinco. 50 AMP 125/250VAC TWIST TYPE LOCKING FEMALE POWER PLUG (CS6364 TYPE). PRICE/EACH. 50 AMP, 125/250 VAC, 3-POLE, 4-WIRE, CALIFORNIA STANDARD, LOCKING FEMALE POWER RECEPTICLE, PANEL MOUNT. PRICE/EACH. CEP #6450M, 50 Foot Long Power Cord, 6/3 – 8/1 SOW Grade Rubber with 50 Amp Power Ends (CS6364/CS6365). Price/Each.